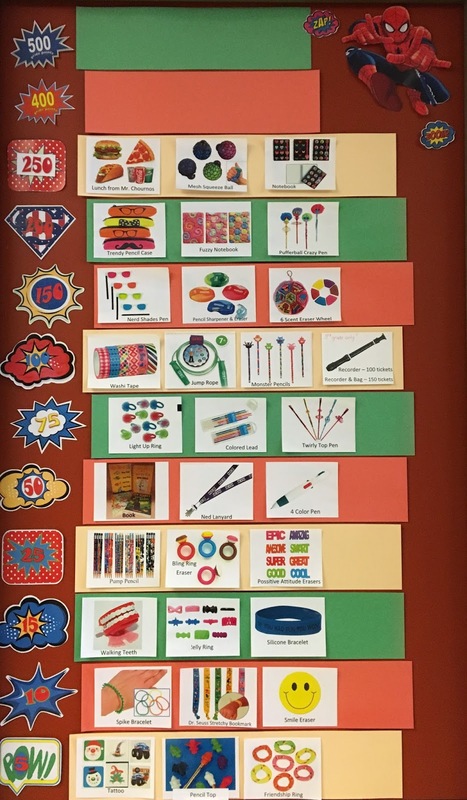 PRIDE STORE IS OPEN ON TUESDAYS FOR 1ST GRADE AND WEDNESDAY FOR ALL OTHER GRADES. Only 1 prize per day per student. Pride tickets must be signed by teacher and have your name on it. Only students buying prizes may be in line. All others must wait outside. Pride tickets must be flat (not folder or crumpled). Please have your tickets sorted by color. Know what prize you want before you get in line. Dishonesty will not be tolerated. If you steal tickets or someone else’s prize, you will lose your Pride Store privilege. Try to have your tickets counted and the correct amount ready. Lunch from Mr. Chournos will vary. He will choose the restaurant each month and everyone will get the same meal. Be sure to bring your tickets to lunch with you. You will not be given a hall pass to go back to your class to get them. Absolutely no playing with prizes in class, groups, or prep times. Keep working hard to earn more tickets. Click HERE open the above in a pdf file. This file will make it easier to view the items.